The New Year begins with a new High School Intern program at HAREC. The purpose is threefold: give students real life experience working in a REC or agricultural setting, engage in hands-on research or outreach projects, and ignite a spark leading to future studies or careers in agriculture and/or natural resources. We are pleased to announce our new Youth, Families and Community (YFC) Intern, Karina Lopez. Karina is a junior at Santa Paula High School and a member of the Human Services Academy where she has completed over 80 hours of job experience internships and job shadowing at local preschools. She is also an active member in SPHS Key Club and SESPEA (Students Encouraging Social and Political Environmental Action). She holds an officer position as secretary for National Honors Society and publicist for California Scholarship Federation on campus. Furthermore, Karina is a two sport student athlete participating in girls wrestling and track and field teams. 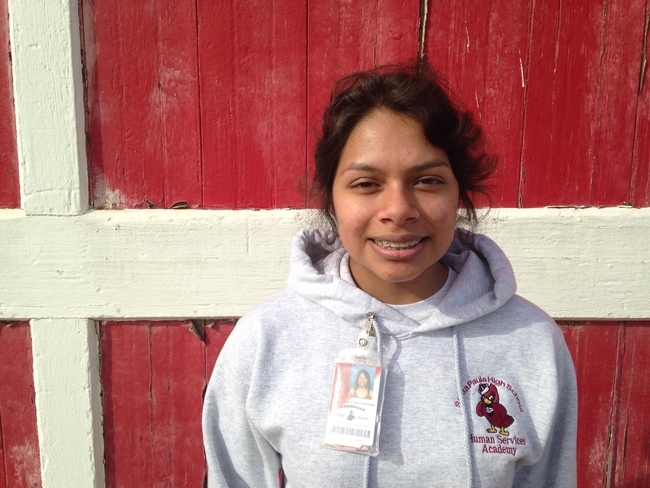 Karina will spend spring semester working directly with the YFC team. She will participate in a variety of activities which include curriculum training and program material preparation. She will also assist with Student Farm and K-3rd grade agricultural literacy field trip activities. Karina is very excited about her new internship at the Hansen and is looking forward to all the new experiences it has to offer.